When it comes to word processing, there is no doubt that Microsoft Word is the go-to program (although Mac users could make a pretty good argument for Pages). However, for all of the convenience and usefulness Word provides us, we’ve all had to deal with its unfathomable desire to format for us. It could happen at any time, to anyone and we’ve all been tempted to chuck our Macs or PCs straight out of the office window because of it. Luckily, DWC is here to save your computer, your window, and your mind with these useful tips to fix those pesky formatting errors. The first major issue with Word is that we sometimes truly don’t understand it. It’s an “it’s not you, it’s me” thing. Nothing is more frustrating than a phantom indentation that throws off the entire focus of the paper. Like any true relationship, we don’t understand because we don’t listen. Unbeknownst to many of us, Word offers diagnostic tools that will help understand what is really going on. 1. The first step to understanding our paper is to reveal what we are really doing when we type. By turning on Word’s “Reveal Formatting Marks” feature, we can get a quick and simple assessment of our formatting. This feature can easily be found on Words home taskbar (indicated by the ¶ symbol on the taskbar shown below). 2. 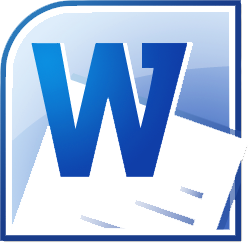 Perhaps even more useful than revealing formatting marks, Word allows users to reveal the formatting of any selected piece of text. Pressing SHIFT + F1 calls up the “Reveal Formatting” menu seen below. Additionally, this box allows you to compare to boxes of text in order to cross-reference your formatting. This is the perfect feature if to use if you feel that something is amiss in a couple of paragraphs, but you just can’t put your finger on it. Select and highlight one section of text, check the “Compare to Another Selection” box at the top of the above menu, and then select/highlight the selection of text you would like to compare. Make sure to take note of the blue hyperlinked options in the above menu. 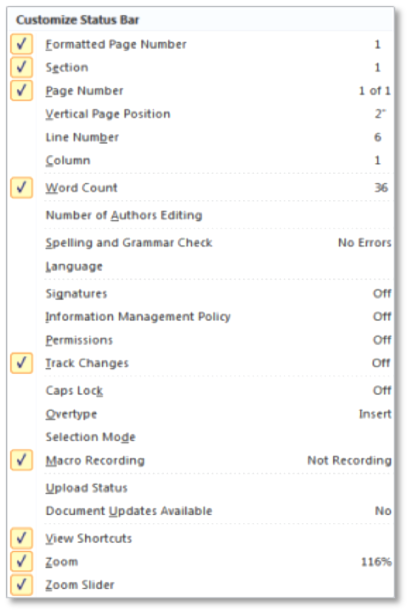 Word has conveniently placed these hyperlinks within the menu so that you have quick access to additional options that will fix or modify the selected text. This is a great way to save a few additional minutes that could be spent perusing extra menus. 3. Don’t ban the bar! That handsome gray strip that runs along the bottom of your Word window has the potential to be so much more than just eye candy. By right-clicking any of that empty gray matter, you will be able to add useful options to the bottom of your page. As you can see, Word offers plenty of options that make your life easier. The “Section Number,” “Page Number,” “Spelling/Grammar Check,” “Track Changes,” “Macro Recording,” and “View Shortcuts” tabs are all ones that I have found to be very useful. I Need This Fixed Now! Let’s face it – there are certain times when we could care less why something isn’t working. We no longer have the time nor patience to run the aforementioned diagnostic checks; we just need it to be right. Word does give users a few quick options that allow users the opportunity to quickly fix the problem. The following are perfect options for those of you who love pushing deadlines to the limit. CTRL + SPACE: This function removes any formatting done at the character level. Do you have a paragraph with tons of boldface or italic words that need to be removed? Have you copied text from various sources in which none of the font has matched up? Highlighting the passage and hitting CTRL + SPACE will remove all of these. CTRL + Q: As I mentioned at the beginning of this post, I’m not sure I’ll ever understand why exactly Word decides that I suddenly need a 1.5” indentation when I’ve been using 1” for the entire paper. This function helps to remove oddities, ranging from unnecessary indentations to strange spacing between lines. Select the passage of text that you wish to fix, hit CTRL + Q, and voilà! CTRL + SHIFT + N: Consider this your reset button. This function will return a selected/highlighted passage to “normal” formatting. Everyone’s normal will be different, depending on which particular style you are using.